Brands should be finding new and engaging ways to entertain and connect with the fastest growing demographic in the U.S., Hispanics. By uncovering insights, advertisers have the opportunity to understand this very diverse group that often have various wants, needs and habits. To engage this audience, brands should utilize video, as Hispanics are the demographic most likely to engage with videos online. According to eMarketer, Hispanics spend much more time watching and using videos online in comparison to their Non-Hispanic counterparts. And with such diverse backgrounds, it’s understandable that there are a variety of needs that brands must address. Bilingual consumers’ behaviors even vary from those that only speak Spanish or English. 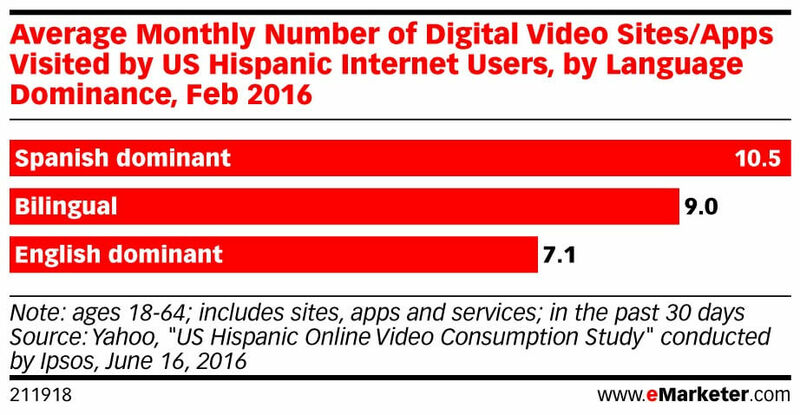 Primarily, the amount of video viewing from Hispanic consumers is due to culture. Young Hispanic consumers are looking for intriguing and unique ways to find information, which is why they frequently turn to video. Overall, brands’ main focus in engaging Hispanic consumers should be by creating cultural relevancy through video content. Generally, leveraging video in digital can be divided into two categories: (1) creating video content and (2) creating video ads. While video ads garner attention and generate conversions, a holistic content approach provides brands with the ability to spread awareness and create a cultural connection with Hispanic consumers—one that typically maximizes brand loyalty. Consumers long for connections, but brands need to shift their attention to Hispanic consumers, who are the least satisfied with their online experience. Through proprietary research with Northwestern University, we created the Digital Satisfaction Index™ (DSI), which measured online consumer satisfaction across four verticals: Household Goods, Financial Services, Retail and Travel. And among those four, Hispanics were always the most dissatisfied in comparison to other ethnicities. This is primarily due to one of the lowest scoring factors among Hispanic consumers within our research—Trust, or the credibility that brands offer to their audience. Leveraging video, a medium often used by Hispanics, in the right circumstances, can help brands regain lost credibility by connecting with consumers on a cultural level. Branded tutorials: Hispanic consumers actively seek visuals rather than articles when looking to understand how to use products. Because of this, brands should create bilingual content—videos in both English and Spanish—giving consumers a choice in what they want to watch. Additionally, creating tutorials in Spanish, and not just English, allows consumers to put more trust in brands, as they recognize that brands are actively trying to connect with them. Testimonial content: People trust other people. In fact, according to the DSI, the majority of consumers find other consumers’ reviews more helpful than branded information and ratings. By leveraging video testimonials, in both English and Spanish, Hispanic consumers will have a better understanding of the product from real users with similar backgrounds. Personalized blog content: Brands should seek to invest in collaborating with popular, Hispanic digital influencers to create video blogs. Popular bloggers typically have a large following, and consumers seek ideas, advice and inspiration from them. To demonstrate, we enlisted a popular video blogger for a large retailer’s product launch. There were two videos created: a teaser video and a full length video. The teaser video alone garnered nearly 25% engagement and combined, the videos generated over four million impressions. Live Video Content: Creating videos doesn’t just mean leveraging YouTube. To create live content, brands can utilize Facebook LIVE or Twitter’s Periscope. Both platforms offer similar features but target consumers differently depending on how brands are seeking to engage consumers. Live videos create a sense of urgency for consumers to tune-in because once the live video has ended, the video is either deleted immediately or saved for a short time. This encourages consumers to watch as soon as they can. By understanding what Hispanic consumers are most interested in through social channels, brands can create videos that are geared towards particular demographics, engaging consumers in the moment. YouTube and Hulu: Through these two popular platforms, brands have the opportunity to reach a wide range of Hispanic consumers, in various languages. Both offer various ad formats, such as: display ads, mastheads, overlay ads, skippable ads and more. Using these two platforms, brands can reach Hispanic consumers based on the types of content they have expressed significant interest in. Were Hispanic consumers more responsive to ads displayed in Spanish? English? Both? Were they more receptive to ads displayed on English videos? Spanish videos? TrueView: This platform is leveraged through Google AdWords and allows brands to target Hispanic consumers based on content they’re already curious about. Leveraging data from Google allows advertisers to target Hispanic consumers where they’re watching videos most and understand the type of videos they’re watching to best engage the demographic. Social Media: Hispanic consumers are constantly utilizing social media to engage with brands. Brands have the option through Facebook, for example, to silently auto-play videos if a user stops scrolling. Because of this, consumers can be exposed to video ads without even clicking the play button. Depending on the type of content the ad leads to, brands can encourage consumers to share that content on their social channels, further spreading awareness and encouraging conversations. Additionally, through social media outlets, brands can gather insights on Hispanic consumers and reach them through their expressed interests on social. By uncovering consumer intent and working towards displaying ads and content that offer cultural relevancy, brands will see a lift in overall engagement, conversation and conversions from Hispanic consumers. To learn more about engaging Hispanic consumers through video, contact your Performics account team.